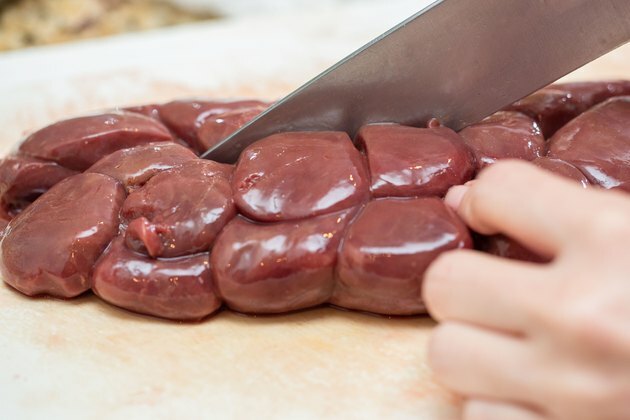 Organ meats like beef kidneys aren't popular in the United States, though French chef and cookbook author Jacques Pepin says that kidneys can be a tender and flavorful cut if prepared correctly. 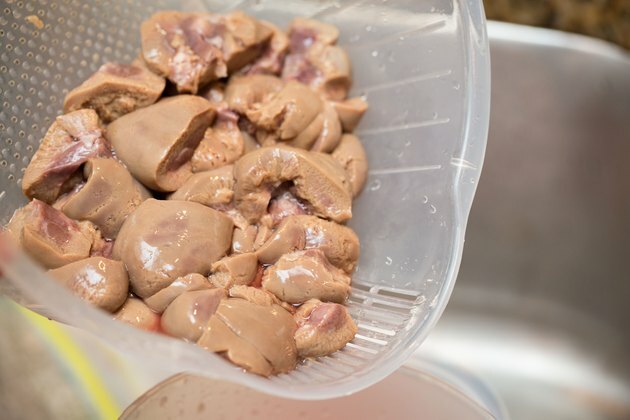 Unlike lamb or veal kidneys, beef kidneys are large and tough and require long braising over low, moist heat to become soft. 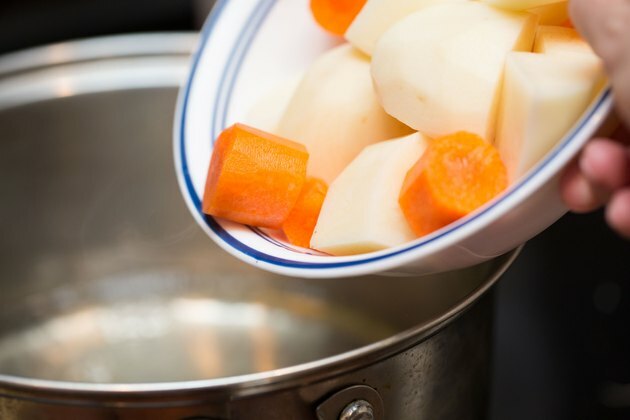 Add chopped vegetables to the braising liquid along with the kidneys to make a stew that can be spooned over rice or mashed potatoes, or serve cooked beef kidneys with crusty whole-wheat bread to mop up the sauce. Eat beef kidneys only occasionally since they are high in cholesterol. Make a cut in the thin membrane surrounding the kidneys using a sharp knife. Remove and discard the membrane. Slice the kidneys in half, lengthwise. Cut out and discard the round lump of white fat in the center of each kidney half. Rinse the beef kidneys thoroughly under cool, running water. Pat the meat dry with paper towels. Cut each beef kidney half into 1 1/2-inch chunks. Fill a large bowl with cold water. Add a small amount of plain vinegar or lemon juice and a pinch of salt. Put the beef kidney pieces into the water and allow them to soak for two hours. Drain the kidney chunks in a colander, discarding all of the soaking water and the liquid that comes out of the meat. 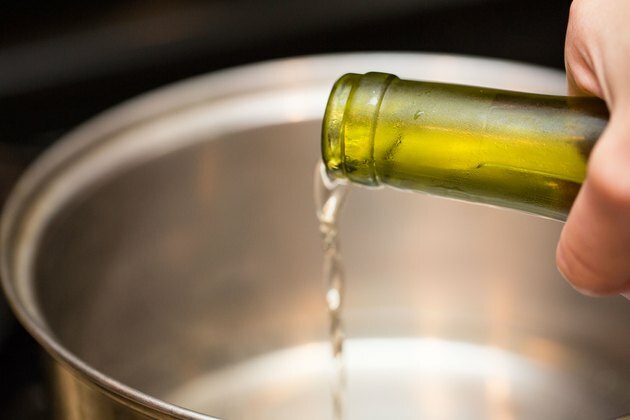 Pour water and your choice of wine into a large saucepan. Plan on 1 cup of wine and about 1 3/4 cups water for every 3 to 3 1/2 pounds of raw beef kidneys. Bring the liquid to a boil. Stir the kidneys into the liquid along with chopped vegetables such as mushrooms or potatoes, if desired, and seasonings like garlic or thyme. Allow the mixture to boil, then reduce the heat to low. Put the pan's lid in place. 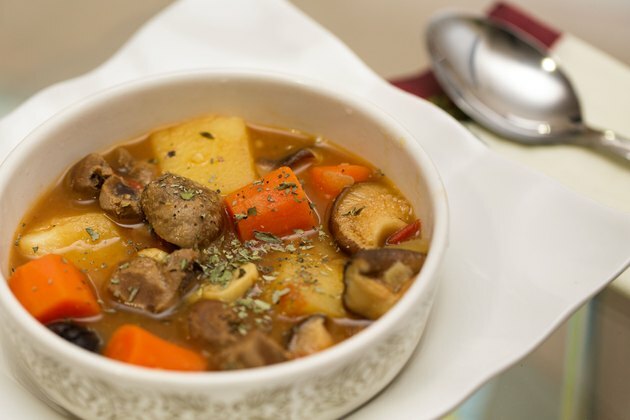 Continue to cook on low, stirring only occasionally, until the beef kidneys and vegetables are tender, about 45 minutes. When preparing beef kidneys, plan on half of one whole kidney -- approximately 5 ounces raw -- as enough for a single serving. 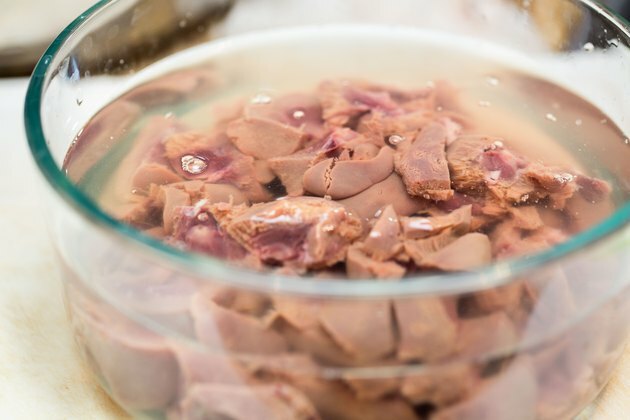 Do not skip the presoaking step before cooking the beef kidneys, or the finished dish may have a strong, unpleasant flavor. 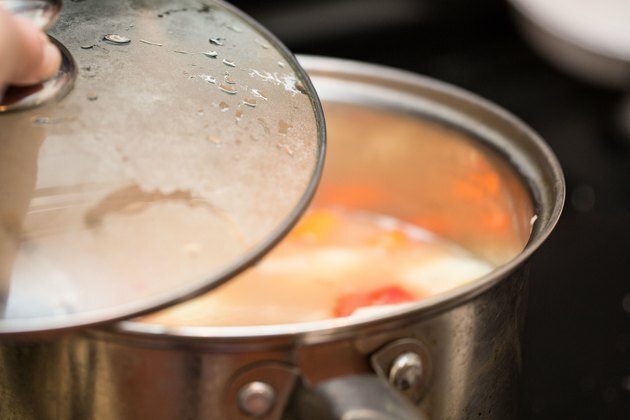 If you don't have time to soak the kidneys for two hours, boil the pieces in water for several minutes and drain them thoroughly before cooking. For a richer, deeper flavor and a thicker, more stewlike sauce, saute diced onions in oil and stir in about 3 tablespoons of flour to make a roux in the saucepan before adding the liquid and the remaining ingredients. 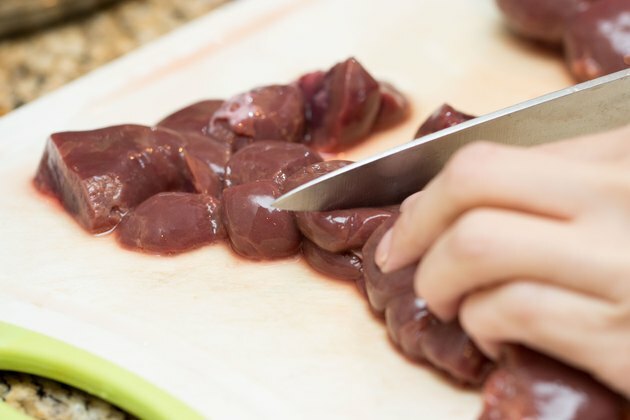 A 3-ounce serving of cooked beef kidneys contains 609 milligrams of cholesterol, far more than the 300-milligram daily limit recommended for healthy adult men and women by the American Heart Association. If you have a history of heart disease or high blood cholesterol, strictly limit your intake of beef kidneys. 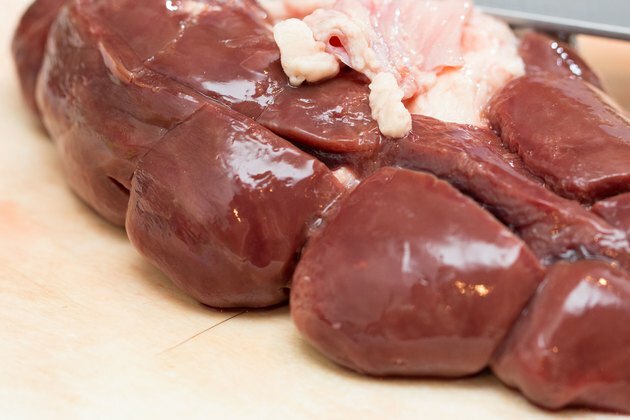 Beef kidneys are high in purines, compounds that the body breaks down into uric acid. With too much uric acid in your blood, uric acid crystals may develop, causing gout or exacerbating symptoms in people with the condition. Avoid eating high-purine foods such as beef kidneys regularly, especially if you've been diagnosed with gout.